I’ll be presenting Get Up Mum at the Fitzroy Town Hall (Reading Room) Wednesday Feb 13. It’s free but y’know, bookings are essential and can be made HERE. Sofie Laguna (Miles Franklin winner 2015) gave Get Up Mum a big plug on ABC News Breakfast just before Christmas. Coolness! Signed copies of Get Up Mum are still available via my SHOP. Get Up Mum has gone into a second printing! Thanks everyone for your support, retail and otherwise. I’ll be in Canberra launching my old University of Canberra’s writing anthology Analecta. Smith’s Alternative Bookstore, Monday November 19, 7pm. Get Up Mum was a ‘chartbuster’ in Sydney this week. Number 7 with a chocolate bullet at Better Read Than Dead! Coolness. The book continues to be well received. I have had things happen like being contacted by people I went to primary school with but barely spoke to who have revealed they are in the same situation as me caring for a mentally ill parent and do I have any advice for them? It’s kinda powerful. I’ve also been contacted by the 2-3 organisations that exist specifically to support children of parents with a mental illness. This is after having gone through my own journey with that sort of thing some months ago and despite having a solid google not really finding anything. My book has acted as a distress flare. Only this week I went and gave a talk at a workshop for FaPMI (there is also Satellite & Kookaburra). There were kids there just like me. There have been recent interviews in Frankie with an excerpt featured on Double J. The Get Up Mum Melbourne launch was epically special. As promised there were 80s ballads, Tripod and Le Snaks – in a church! Went along to @justinheazlwood‘s Book launch for “Get Up Mum”. Probably the most entertaining book launch I’ve attended. Storytelling, 90s Eucharist, pipe organ playing (The Never Ending Story theme), @TripodActual‘s harmonies moving us to tears and lots of humour of course. A tender and compelling chateroo with Myf Warhurst. Another day, another insanely personal interview with Frankie magazine. Rigorous yarn about schizophrenia on RNs Life Matters. Plus more radio action with ABC Adelaide & ABC Sydney. 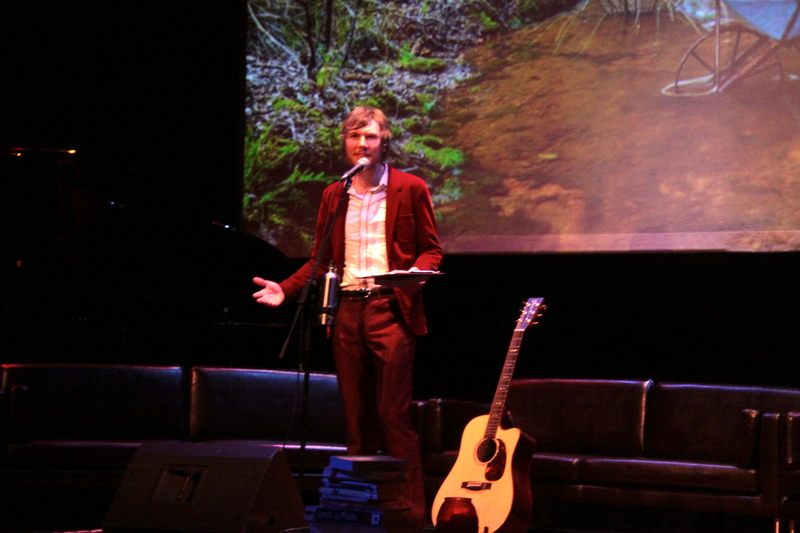 MELBOURNE WRITERS FESTIVAL – Sep 2. BRISBANE WRITERS FESTIVAL – Sep 9. I had a piece published in the Good Weekend about phone boxes on October 21. I played Harry Potter in the Wheeler Centre event Harry Who? The True Heroes of Hogwarts October 25 at the Athenaeum Theatre. I used to get called ‘Harry’ when I worked at the Canberra Labor Club. I was the only bloke with mid-length hair and glasses serving glasses of mid-strength. Ten Melbourne writers were asked to write about ten locations around Darebin for Writing This Place. I was given Northcote Town Hall. For my piece Stella & the Elders I wanted to reflect on disability advocate Stella Young who performed her show ‘Tales From The Crip’ there. I also included some Aboriginal Dreamtime figures. It’s the first fiction I’ve written in ten years. I’ll be reading my own writing at Justin Heazlewood: Selected Readings at Bella Union (Trades Hall), September 24 from 2:30pm. I’ll be joined by special guest Elizabeth Flux. Four of my columns are featured in Frankie Magazine’s anthology Something To Say. A piece I wrote was featured in the book Letter To My Teenage Self published by Affirm. It’s been collated by a 13 year old Melbourne schoolgirl to confront bullying. It includes contributors such as Maggie Beer, Peter Alexander and Kate Ceberano. Icecream, PJ’s & Bedroom Eyes. I also have a Funemployed related piece included in Copyfight, released last year. Funemployed was nominated for the Most Underrated Book award. (It’s a thing.) I presented Funemployed: The Sequel at last year’s Bigsound feat. Jen Cloher in scintillating form. Crazy Bastards was nominated for Best Performance at the Online Video Awards & an AWGIE in the ‘Drama or Comedy’ category. My ditty ‘I Hate Myself’ was recently featured on RN’s Earshot during mental health week. Still got it. Here’s a clip of my Ode to Melbourne inspired by a John Bracks painting at the NGV. Funemployed LP is out on Bandcamp and iTunes. You can hear the RN Podcasts. I recently appeared at Margaret River Writers Festival, Music NT’s Intune conference and the Smith Family’s ‘We Mind Be Kind’ anti-bullying campaign in Tasmania. My wee ABC series Crazy Bastards has been remembered through a series of recently published stills. A piece I made for ABC’s The Mix. Funemployed Book and EP are out and about! You can read a sample chapter The Black Cat. Here is my Eight Things They Don’t Tell You About Being An Artist. Plus a self-interview with Three Thousand and a tell-something interview with Broadsheet. I made a Mix for The Lifted Brow – songs for artists. Art Day! was a ripping success. I read the whole book. It ran to time. There was palpable warmth emanating from the generous hearts of Australia’s creative brethren. Ultra thanks to my wing-readers Sabrina D’Angelo & Oliver Clark. Plus resident artists Yvette Coppersmith, David Blumenstein & John Pace. Love to The Awkwardstra and Fluorescent Organs. Two thumbs up.